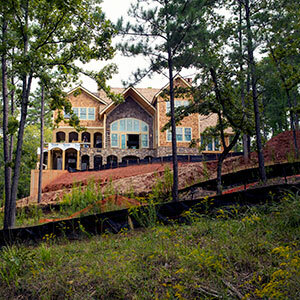 The Signature Home Program was designed to engineer the anxiety out of designing and building a home at Reynolds Lake Oconee. 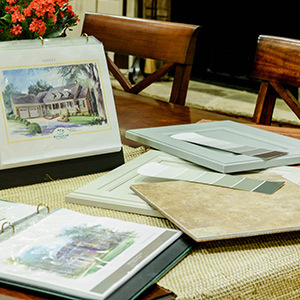 With over 20 years of success, the more than 30 plans allow homeowners unique customization while saving them time on approvals and providing them accurate costs from the beginning. 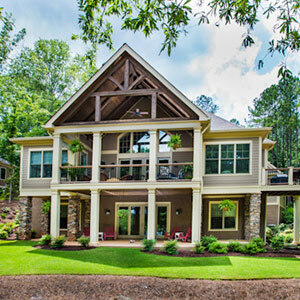 We checked in with two of our Signature Builders, Paige Ruhl of DreamBuilt and Kim Buechler of Rick Buechler Custom Homes, Inc. along with, Robert Steverson, Director of Signature Homes at Reynolds Lake Oconee to see the current building trends they are seeing within Reynolds. How many houses are you currently building in Reynolds and how does this compare with a few years ago? Paige: We have 12 houses currently under construction in Reynolds. That number is three more than this time last year and in 2016. Kim: We are currently working on 13 residential projects all in different phases of construction. In past years, we have maintained 6-8 homes always under construction. Robert: Per our September Architectural Review Board (ARB) Activity Report and Rooftop Report, in the last 12 months, 121 new homes have started in Reynolds and there are currently 129 homes under construction. Compared to the same time frame as last year, new house submittals are up 50%. What are you seeing differently today from five years ago and do you expect that trend to continue? Paige: The biggest difference in today and 5 years ago is the number of projects. We are continuing to meet clients from all over the country and all over the world. I can see first-hand why people want to be a part of the Reynolds community. It is an amazing place to raise a family or to retire. I am not sure how long the pace right now will be sustainable but we are happy to be working with everyone as long as we have an excellent subcontractor base in place. People are wary of the potential of a slowdown, so I know that DreamBuilt is continuing to build smarter and ensuring that value is a cornerstone to our building process. Kim: Sizes of homes are changing again. We are seeing a trend of larger homes with outdoor living being very important to clients. Robert: Clients today seem to be more mindful and interested in planning for what is referred to as “aging in place.” Aging in place is the design and build of a home that will accommodate the change or limitations that may occur as one ages such as the ability to go up and down stairs. The topography at Reynolds does not lend itself to allow for a lot of single level homes. So the key feature of aging in place would be the onset of so many elevators being integral to the design of a home. Reynolds first introduced the use of elevators in the Signature Home Collection Model Center on Mill Creek several years ago. Since then clients are now realizing how adding an elevator allows them and their guests full, and sometimes easier access of the home. What are some of the most popular features and upgrades that you are seeing most often? Paige: We are consistently building incredible outdoor living spaces including outdoor kitchens, living rooms, fire pits, pools, and water features. 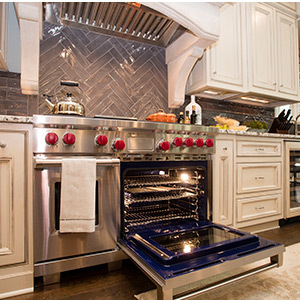 Inside, kitchens are getting larger as entertaining spaces, wine rooms, and bunkrooms are becoming elaborate retreats. Kim: Some of the most popular features include interior linear fireplaces with contemporary surrounds, waterfall mitered edge counters at islands, conditioned wine rooms/cellars, pools/spas, outside fireplaces/firepits, floating vanities, more contemporary plumbing fixtures, and free-standing tubs. Most clients also now prefer all hardwood throughout their homes in place of any carpet. Robert: The bulk of upgrade dollars spent is in the kitchen and master bath areas. After that, people are spending dollars on the entertainment parts of the house – i.e. bars, rec spaces, patios, and fire pits. Is there anything that surprises you right now from customers? Paige: The thing that surprises me most about customers is how much information they have going into the process. Thanks to the internet, HGTV, Pinterest, and Houzz, people come with ideas and direction. The difficult part of that is that people think everything that they see is available immediately and within their budget. Kim: Clients are building immediately after their property purchase versus waiting a few years to build. They are ready to enjoy the wonderful lifestyle offered at Reynolds. Robert: We try to read as many industry publications and trend reports as possible. So as clients are coming in we are prepared to discuss such items. One unexpected change in design trends is the interest of adding fireplaces to terrace level living and multiple porch spaces. From dirt to diamond, let us help you build your dream home at Reynolds. Building or buying an existing home is a personal choice. After 17 years of helping clients decide, here are some pros and cons to consider.